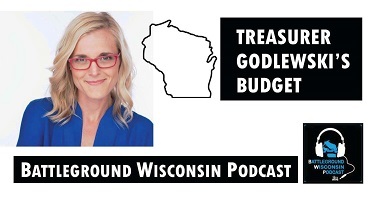 MILWAUKEE - In the latest episode of our What the Godlewski does the State Treasurer do? segment, we discuss her state budget request for the resources needed to properly run the office. We also discuss Godlweski's plans to create a state-run retirement public option and opportunities to refinancing student loan debt. We review the week’s news including: Judge Lisa Neubauer concession in the hotly contested Supreme Court race; an Appeals court sides with Governor Evers on appointments; and Sen Tammy Baldwin joins Sen. Bernie Sanders in introducing a new Medicare for All bill with a record 13 co-sponsors. We also review the top issues raised during the first 2 Joint Finance Committee public budget hearings in Janesville and Oak Creek, and debrief the latest MU Law poll finding of 70% support for expanding BadgerCare.